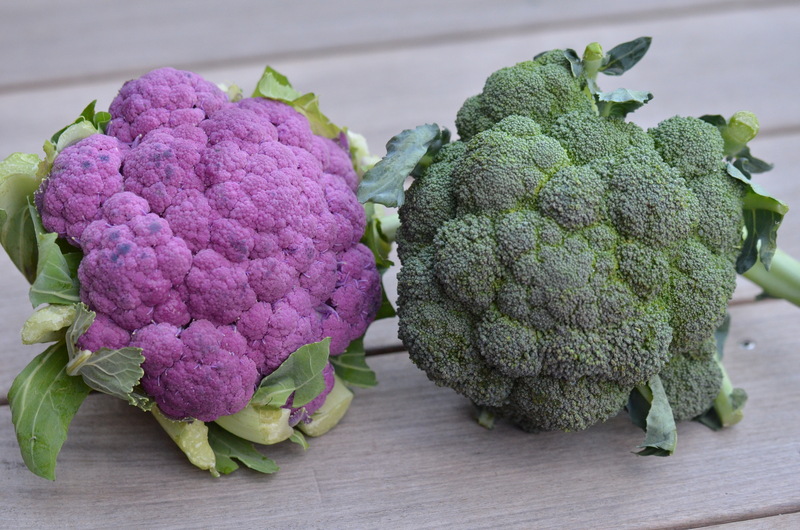 Broccoli and purple cauliflower. 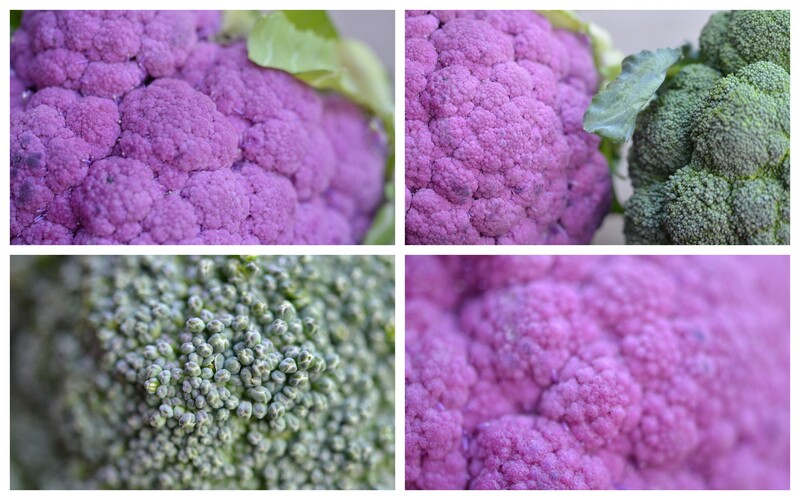 Broccoli has been a favourite in my kitchen for a long time, but I’d never seen purple broccoli before. I’d heard about all different kinds, like orange cauliflower, romanesco or the purple variety, but the only ones I’d actually seen around here are the classic white variety and the romanesco with its beautiful pointy roses. So when I saw a few of these beauties on display at one of my favourites fruit and vegetable stalls at the weekly market in Luxembourg City, I jumped on the occasion and carried one home where I gave it the appropriate VIP treatment by having an extended photo shoot along with its green companion. Now what to do with it? I didn’t want to cook the cauliflower to preserve the beautiful colour and I’d made a very nice salad, once again from Claus Meyer’s book, but using broccoli alone. But adding a splash of colour and additional flavour to the bowl wouldn’t hurt so I decided to make this salad again, with a few tweaks compared to the original recipe. Claus Meyer’s recipe calls for Skyr, an icelandic dairy product, which of course I had no chance of finding here. The first time I made the salad, I used greek yoghurt as a replacement, and this time, I made the dressing with quark cheese. Both were equally good. I only used toasted, unsalted cashew nuts as a topping because I love them so much (compared to some other nuts) while Meyer uses a mix of different nut varieties. You could use whatever tastes best to you. The result was a wonderfully flavoursome bowl full of colour and crunch. Not to mention it’s very healthy and filling. You could serve it as a side (I served it as a side to a hearty pasta bake the first time I made it) or as a balanced, healthy meal. Clean the broccoli and cauliflower and cut off the leaves. Then you will need to blanch your vegetables. I used different techniques the two times I made the dish and I found the second one to be quickest and easiest. The first method used was to divide the broccoli (and cauliflower) into little roses and blanch them. The second time, I just stuck the whole head (cleaned, of course) into the boiling water, holding it by the stem, and divided the heads into roses as soon as it had cooled down a bit. As I said, it is quicker and I didn’t notice any difference in flavour or texture. So, no matter which method you are using, bring a large pot of salted water to a boil, then add the vegetables and blanch for about 30 seconds. Scoop them out and set aside to cool (and divide into small roses if you’re using the second method). Save 2 cups of cooking water. In the meantime, toast the cashews by placing them in a pan on relatively high heat, without adding any oil. Watch the nuts carefully to prevent them from burning and toss several times to make sure they toast evenly on both sides. Set aside. To make the dressing, combine the yoghurt or quark cheese, oil and some of the reserved cooking water. You should add the water gradually to avoid the dressing to become too liquid. If you’re using quark cheese, you’ll need more water as the cheese has a firmer consistency than the greek yoghurt. The dressing should have a light, creamy texture, not too firm, not too runny. Add the crushed garlic, 2/3 of the chopped chives and season to taste with salt and pepper. Stir until the mixture is smooth. 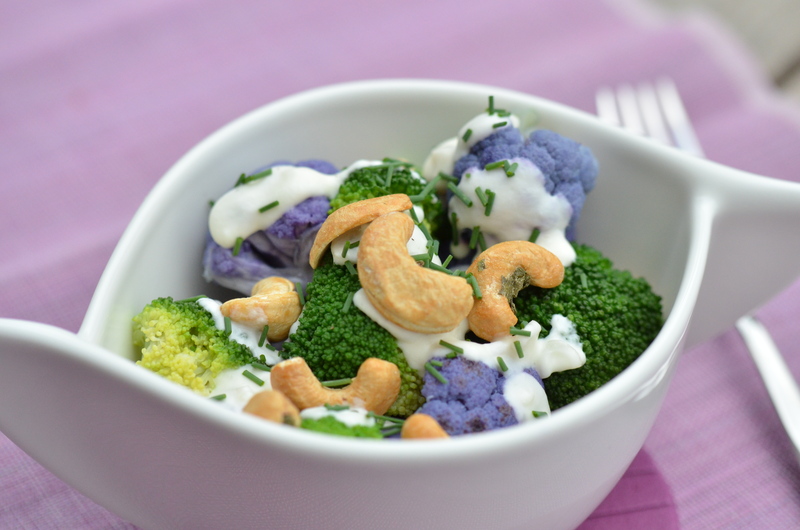 To assemble, place a handful of broccoli and cauliflower roses into a bowl (I like to serve it in individual bowls as it looks prettier), dress with a couple of tablespoons of the garlic sauce and sprinkle with cashews and chives.